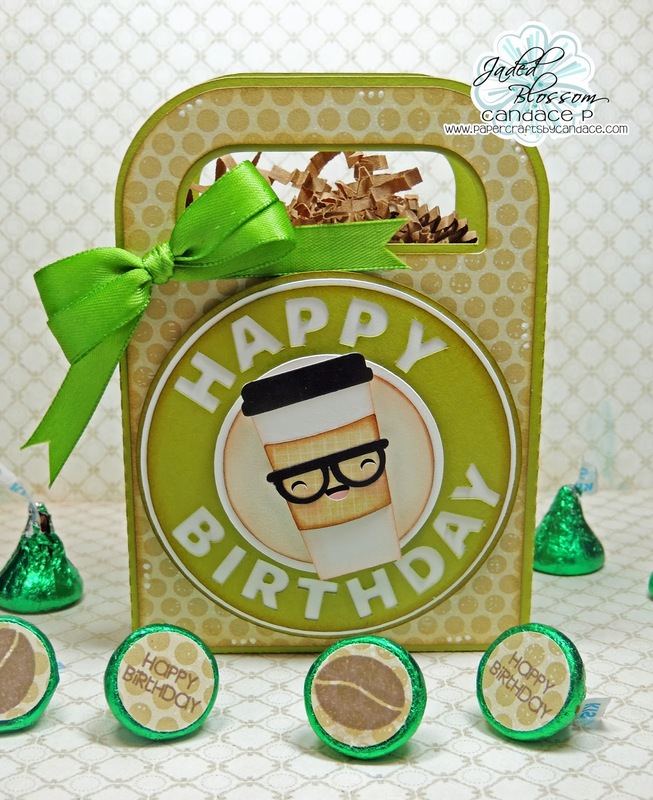 Paper Crafts by Candace: It's my BIRTHDAY blog hop! This hop is sponsored by SVG Cutting Files and Jaded Blossom! Now if you are here from Ann's Blog then you're in the right place, if not then you may want to start in the beginning. If you get lost I have the entire line up below this post. Here is what I created! Recognize the image on the front of the bag? Its almost the same one as in the birthday banner above!! Ann changed it to Happy Birthday though so anyone can use it. Its now available in the SVG Cutting Files store! I put it on a handle bag also from SVG Cutting Files. Here is a close up of the cute little nerdy coffee! And here is a close up of the candies inside. I used Jaded Blossom's Java Time to stamp on the bottom. What's a party without some goodies?? 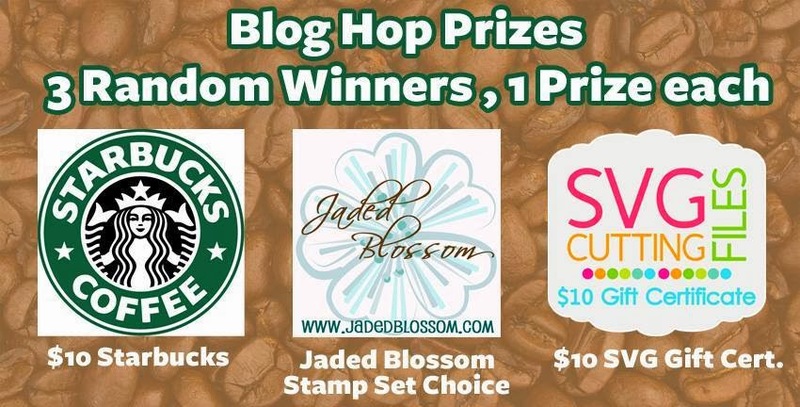 In order to enter to win our goodies, please make sure to do the following: 1- Follow every blog on this hop 2- Comment on each stop of this hop 3- Like the Jaded Blossoms Fan Page 4-Like the SVG Cutting File Fan Page We are at the end! If you missed any of it, please start at the beginning! LOL So cute! Happy Birthday Candace! Happy Birthday Candace!! Awesome creation and love the hop so many great creations. Wow! What a super cute gift for yourself! Happy Birthday Candace! Your birthday blog hop was simply amazing! Hope you have a diva-luscious day! Happy birthday! What a wonderful hop!! Hope you have a fabulous day! Happy Birthday! Hope your day is special. Loved the hop! LOVE your logo bag and cute candies! Happy Birthday Candace...I hope you have a wonderful day! BIG HUGS!!! Absolutely gorgeous. Happy birthday !!!! Happy Birthday. Love it all. You guys are amazing. Happy Birthday! This is my first Blog Hop so I feel like I have been to your birthday party! 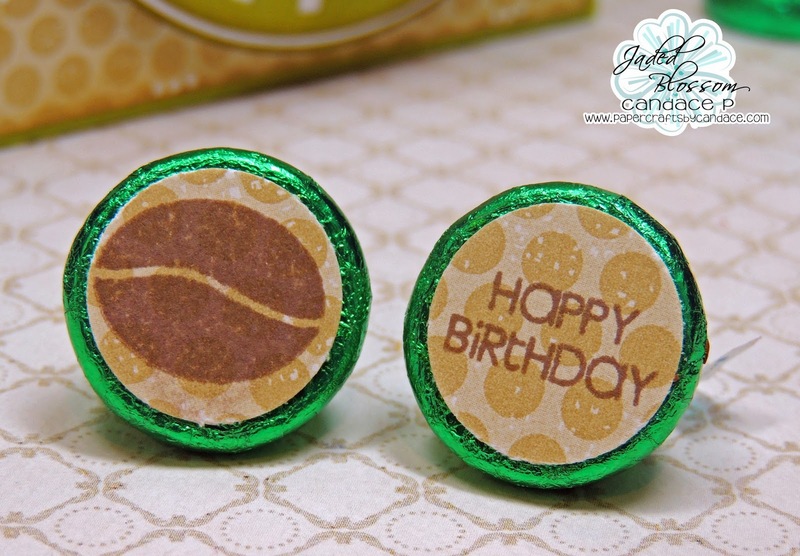 Your gift bag & candies are awesome - I just placed my first Jaded Blossom order yesterday & can't wait to try out the candies stamps (and now my wish list has grown following the hop!). Have a FANTASTIC day!! Love it....and Happiest of birthdays!!! Loved your project. Happy Birthday Candace. Happy Birthday Candace! Cute project! Your friends seem to love you A LOT!Have a great day! Happy birthday!! What an amazing way to kick off your birthday! Happy birthday!!!! Hope you have a great day! Love the needy coffee. Everything was great. Happy Birthday! Love the project with the nerdy theme! Happy Birthday, Candace!! I hope your day is AWESOME!! Happy Birthday Candance. Have a great day! Awesome birthday hop!!!! happy birthday girl... hope you enjoyed your hop!! Happy Birthday! Love the project because it's super awesome! Happy Birthday! What a lucky girl you are! The girls all out-did themselves! Happy Happy Birthday Chicka, I hope you have an amazing Day! happy Birthday many more to come. Happy birthday, Candace! What a fun way to celebrate your special day! Your bag is fabulous - especially with that adorable coffee cup! Happy Birthday! I love that cute coffee cup! Such cute glasses! Love, love it! Happy Birthday Candace!!! Will check this file in the SVG store! Thank you for the free files along the way. Happy Birthday Candace! The hop was fun and I really liked your project. love your bag! Happy Birthday Candace! Love the nerdy coffee! Happy Birthday ! Thanks for these blog hops. Really enjoy seeing what you gals make. Really cute. Happy Birthday. Candace. Hope it's a good one. Happy Birthday!! You have a lot of great friends! Happy Birthday! Great idea...just love the cup! Happy Birthday! It was a great hop! But then all of them are always great! What a talented team! happy birthday, Candace! Hoping you're enjoying a phenomenal day and celebrating in style! Happy, happy birthday Candace! Hope you have a wonderful day! Great project-love all the inspiration today! Happy Birthday Candace! This was a fun party blog to follow. Enjoy your day, and before I forget.....You are very talented. Keep up the great work. happy happy birthday1!!! This was a great blog hop! Have a wonderful day! Happy Birthday Candace! Hope you have many more! You did a great job on the bag. I love the colors! Happy Birthday Candace!! Hope you have a wonderful day!! Happy Birthday! Love the bag. Happy Birthday!!! Card was super cute! Happy Birthday to you! I love your creation and also the whole blog hop - the ladies showed awesome creations and also some awesome funny ones. Happy Birthday! Love your cute little coffee cup and what goes better with coffee, yes chocolate. Happy Birthday Candace! This is a super neat file and a must have in my opinion. Happy Birthday!!!! Loved the hop! Happy Birthday! Love the project and hop! Happy Birthday! What a great way to celebrate your day! Wishing you a very HAPPY BIRTHDAY! God bless you. Very cute project. you must know yourself pretty well. I think this is my favorite! what a fun day for you. I don't know how the inner workings go on these but I hope you were able to be surprised by some of them. What a great testimony to you Candace that your friends would do this for you. Happy, Happy Birthday! Happy, happy Birthday Candace. I love your gift bag and all the wonderful tributes made for you by your crafty friends. What a wonderful group!!! Thanks for all the free files - can't wait to use them and add the new ones to my ever-growing collection. Awesome hop and happy birthday Candace!!!! Happy Birthday!!! Have a fabulous day!! Happy Birthday!! Hope you are enjoying your special day. Love this cut! Hope you have a wonderful Birthday!!! Happy birthday!! You are so loved!! Thank you for all you do and I hope you have a fabulous day! Happy Birthday Candace! What a fabulous blog hop. Thank you for all the inspiration and the free files. This was a wonderful way to start my day. Happy Birthday!! Loved the hop and all of the wonderful creations! What a cute little bag! Hope you have a wonderful birthday! fisrt and foremost, HAPPY BIRTHDAY!! I hope your day is great. what an awesome hop and fabulous projects. Love your fun gift bag. Happy Birthday this hop is awesome partially because it's for your birthday but other part is because of all the "starbucks" stuff! LOVE! Happy Birthday!! Hope it is a great one!! Love your bag! Happy Happy!! Love your nerdie coffee cup!! Have a super day! Happy Birthday Candace! Great project! Love all the wonderful ideas and awesome blog hop! Have a great day! HAPPY BIRTHDAY!!! Blessing! Thanks for the hop, enjoyed all the great work. Love all the hops and all the files! Thank you for sharing them! Happy Birthday Candace!!! After this hop I feel like I know a lot about you. :o) Your birthday gift bag is adorable!!! Enjoy all of your goodies and birthday!! Happy Happy Birthday Candace!!!! Hope you are having the BEST day!!! I just LOVE your project!! Super adorable! Everyone did an amazing job on their projects!!!! Happy Birthday! Thanks for the inspiration to this blog!!! Happy Birthday! Love your Birthday Card to yourself! I wish you the best on this day and always! Have fun! Happy Birthday Candace!!! What a fun hop - hopefully you feel a little extra special today!! Wishing you a wonderful day & a great year ahead!! Great project Candace!!! And I wish you a VERY happy birthday my crafty friend!!! I hope its a perfect day for you!! Love love love!!!! Happy Birthday Candace!!! Hope it's a good one! Loved the hop and you are lucky to have such a wonderful circle of crafty/talented friends!!!! I hope you enjoyed your day!!! so super cute.....Happy Happy birthday to you! Happy Birthday Candace, great project, what a fun hop!! Happy birthday. Hop you have a great day!! A very happy birthday to you!!!! This is such a darling bag!! That coffee cup is too cute!! Hope you've been having a wonderful day!!! Happy , happy birthday !!! What a fun project you made !!! Love the glasses !!! Fun! This was a great hop, as always. Happy Birthday! Cute bag and like the sweet face and glasses. Oh, almost forgot! Have an awesome & incredibly fun Birthday. So cute! Happy Birthday Candace! Happy Birthday!!! Wonderful hop! Love the nerdy coffee cup!! I am so lucky to be able to call you my friend! I hope you had the best birthday ever...and enjoyed the hop! Happy Birthday!!!!! Happy Birthday. What a great hop. Happy birthday! Love the card. Wishing you the best of Birthday's and a terrific year. Your projects are super sweet! Happy Birthday… Started this hop this morning before work and couldn't finish until just now. You are one lucky birthday girl. This was so much fun and now I'm following some awesome blogs and Jaded Blossoms & SVG Cutting FIle FB pages. Happy Birthday, Candace! Many blessings are hoped for you! Happy birthday and love the nerdy coffee. Happy Birthday!!! Love all the projects. Great Hop! Happy Birthday, Candace! 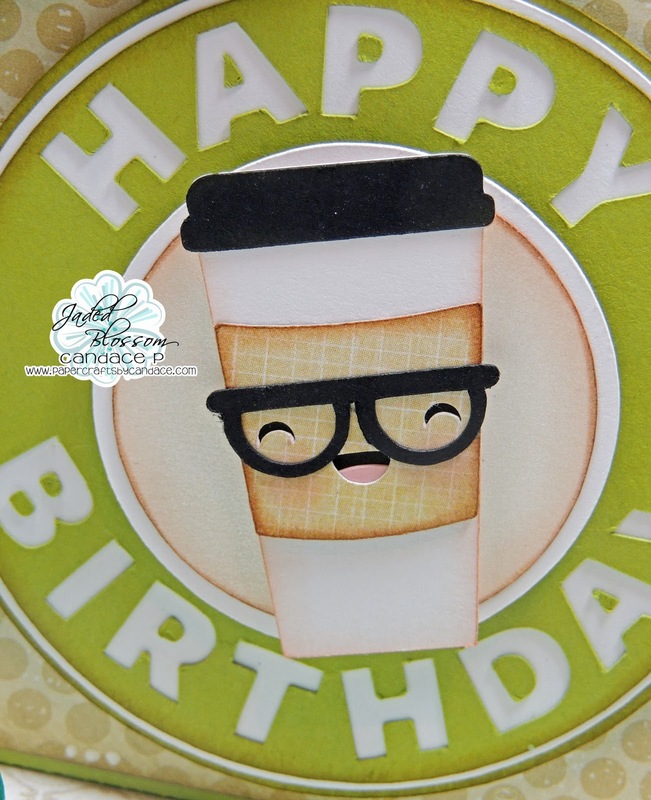 This is so cute, love the coffee cup, Happy Birthday. Wishing you a fabulously Happy Birhtday! Happy Birthday,Candace!!!! Those are very cute! Really nice and originally way to celebrate your birthday! Have a wonderfull day! Happy b'day. Thank you for the files and inspiration! Happy Birthday!! Loved the projects!! Happy birthday Candace! I stayed up late to follow your birthday blog hop. Very cute nerdy birthday bag. Love the file and the kisses with the stamped image on the bottoms. Thanks for the chance to win blog candy on your birthday!!!! HEY HEY HEY!!! HAPPY HAPPY BIRTHDAY! This treat bag is so stinkin cute! I hope you had a great birthday and enjoyed your birthday hop! Happy Happy Birthday Candace!!!! Hope you had a wonderful birthday. I had fun hopping on your birthday! Happy Birthday and great project and hop. Follower! Happy Birthday!! Love your project. happy birthday! love your hops, and really love your designs! Thanks for the birthday hop, it was fun! Happy Happy Birthday!!!! I hope you had the most incredible and special day! I wish more than anything I could have participated in the hop. Next year for sure!!! Everyone rocked their projects!! Absolutely LOVE your treat bag! It is sooo cute!! Happy Birthday Candace. Hope you enjoyed your birthday blog hop. I sure did. Happy B Day... Love your project!